I have been feeling incredibly weary lately. Physically, yes, I am exhausted and uncomfortable a lot of the day due to pregnancy. But my weariness extends beyond just that: I am weary because my mind is racing with all of the things that I'm not staying on top of or the things that I'm forgetting to do or the decisions I have to make but feel too tired to make. I'm essentially not living up to the standards I've set for myself, and it both frustrating and wearying. Sometimes I even feel guilty that I'm not doing the things that I want to do/think I'm supposed to do. 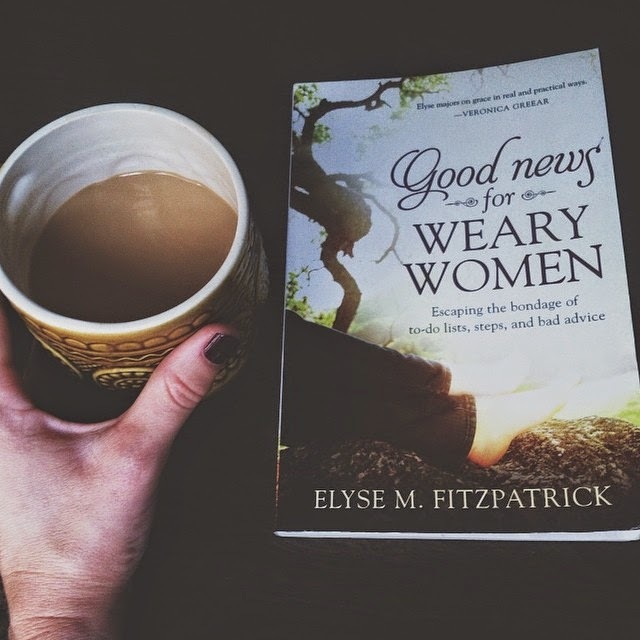 All of this has made me think about this book Good News for Weary Women. I read this back in September but have recently been flipping through it and re-reading the parts I had marked. The bottom line is that I have created all of these rules and standards for things that I think I should do or would like to have accomplished. I'm a perfectionist, so having high standards is in my nature. I want to have a really productive day at work, get in a good workout, make a healthy dinner, have a relaxing evening at home with my husband, have meaningful devotions, stay on top of all of the chores around the house, keep in touch with family and friends out of town, spend quality time with friends in town, be actively involved in ministry at church, go to Bible study, get to know our neighbors, blog, research new recipes and make lots of delicious food from scratch, finish decorating our house, and the list goes on and on. None of these things are bad (which is exactly why I strive and wish I could do all of them all of the time), but as the book says, "the trouble comes in when those things start to define us if we do them or guilt-trip us if we don't." "Our highest calling is to believe in and love the gospel and then to live our lives in the light of all Jesus has already done for us." My highest calling isn't to take care of my home or do really well at work or be a great friend; it is to believe, rest, and rejoice in the work that Jesus did in His death on the cross, allowing that to transform every aspect of my life and motivate all that I do. He died in my place, taking on all of my sins and failures. I could never on my own live up to God's holy and perfect standard, but because Jesus took my place and I have placed my faith in Him, God now looks at me and all of my failures and is pleased - He is pleased! It's hard to believe since so often I am not even pleased with myself. But God in His grace sees me as His beloved child and fully accepts me through the blood of His Son. This truth of the Gospel is what I am reminding myself of daily as I feel frustrated when I don't feel like I'm doing enough. God's love for me is not dependent on how much I do or how well I think I'm doing at home or work, and that is the good news for those of us that feel weary. Oh, Sherri, I can so relate to you! When I was in the throes of dealing with adrenal fatigue, hormone imbalance, gluten intolerance, and anxiety, I felt like I was falling so behind! Every day I felt lightheaded and would have to lay on the couch for awhile when I got home from work (in hindsight, I should have taken off work at least a few times, but I just pushed myself through it). But I wasn't letting anyone down besides myself - I had also set such high standards for what I thought I should be doing - especially even just free time activities! Every night I thought I needed to play the bass, read, blog, watch a tv show, play a game, etc. I wasn't even relaxing because the fun stuff was bogging me down. Repeating the mantra "stop the glorification of busy" was huge for me. I had to take a step back and assess what was necessary and through it I've really come to realize that nothing we do is really THAT essential. The ONLY thing Jesus wants from us is to have faith in Him and to love Him. Which is craaaaazy. The gospel is awesome :) So glad you're learning it more deeply, even though it comes at a cost. Hugs to you, friend! Excellent post, Sherri. Jesus has done everything necessary for us and He is enough. Praying that you will continue to keep your heart and mind on the Gospel as you struggle through your days, and that you will rest in Jesus. Love you!